The experience of Rick Buller Financial Services, LLC is that over a complete market cycle, it is much more important to manage the downside risk of the stock market than it is to show spectacular growth on the upside. The investment objective of our Firm is to deliver consistent performance over time along with growth of capital with reasonable risk. The primary investment objective is to preserve the principal value of the assets in your account. The secondary investment is to grow the principal value of the assets in your account. Why is this important? Look at the impact of a down market! you need this much return just to get back to even! Change in Behavior is needed! The most popular investment management strategy is called the Buy-and-Hold. Probably because it is the easiest to do! Develop a retirement plan menu by putting your money into some investment names you recognize - and hope for the best. Do you do your job the same way you did 10, 20, or 30 years ago? Do you bank the same way you did when you received your first paycheck? Does your doctor use the same medical technology that was available when you began your career? Have your job skills stayed the same since you began working? 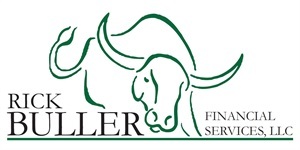 Rick Buller Financial Services, LLC utilizes tools and strives to develop a relationship with investors to handcraft a plan to help protect and grow the value of your plan through and full market cycle.